The unstoppable fighters of Brave Combat Federation 4 takes over Abu Dhabi for one heck of an action-packed event! 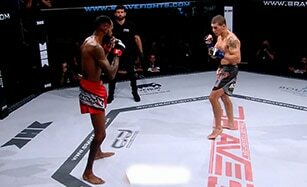 Tune in for Masio Fullen vs Elias Boudegzdame's fight in this part of Brave 4 and don't miss out on the other explosive bouts! Myx TV Fight Night: Bra..
Myx TV Fight Night: Max..
Brave 2 Dynasty Part 2:..
Brave 2 Dynasty Part 1:..